Last week provided the opportunity to make peace with our pasts. What can we now expect with this week’s energy? Freedom to be ourselves! Freedom to share our selves, our talents, gifts, creativity and abundance with others! Freedom to do what we’re here to do, help those we’re meant to help, and build and grow the collectives around us. 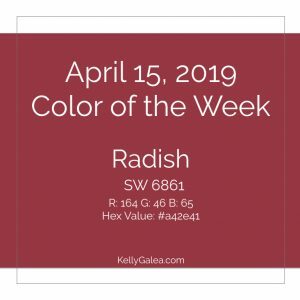 Our color of the week is Radish. Use this hue to help release any lingering ghosts of the past and embrace the freeing energy to be found this week. Reflect and Reveal the growth you’ve realized. Reflect and Reveal who you are, where you are, and how you can help and be of service to your collectives. Colors selected to represent the energy of each month and each week of the year are Sherwin Williams colors. Their architectural and design palette has been my go-to for years! You’ll see the color here, along with the Sherwin Williams paint code plus the RGB and hex code equivalent values. This helps if you’d like to use these colors in your physical space, on your desktop or as you Reflect and Reveal your most vibrant life this month.